You get the soothing tones of the answer-bot, asking just what extension you're trying to reach... What extension?! D'oh! Rantus Interuptus! Next time you want to give our humble hosts (or anyone else) a quick call, save yourself some frustration and add the extension right into your iPhone contact info! We'll show you how, after the jump! 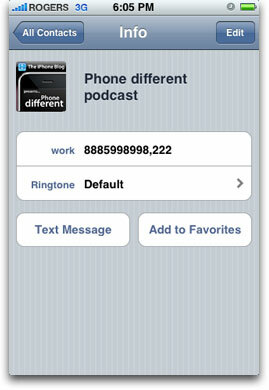 Okay, here's how you can add extensions -- or any form of extra digits -- to a telephone number on your iPhone. First, access your Contacts (either via the Phone App, or the dedicated Contact App in 2.x). Pick the Contact you want, and tap Edit in the top right corner. Next, pick the phone number you want to add the extension to, and then tap the +*# button on the bottom left of the Dial Pad. As the button label implied, you can add the plus, star, or pound symbols. Tap Pause to add a comma (,) -- or short, silent wait period. Add the numbers for the extension, then tap Save to apply the changes. And we're done! Have more Contacts you'd like to extend? Simply rinse and repeat as often as needed. Then get ready for the next Podcast, and let Dieter and Mike know how you really feel -- fast!